HORNBEAM (Carpinus betulus). Hedging Plants, Trees, Shrubs and Conifers. This plant has been awarded an RHS Award of Garden Merit. Hornbeam hedge at Garden Centre. Hardy native plant similar to Green Beech with mid-green leaves, suitable for heavy wet soils, and frost pockets. Green catkins from late spring to autumn, turning to clusters of winged fruit in autumn providing food for wildlife. Shade tolerant. For an upright, fastigiate form click here. HEDGE Retains brown foliage in winter, especially if pruned in late summer. For hedges 3ft (90cm) upwards. Plant 9-18ins (23-45cm) apart or for a denser or stock-proof hedge plant in a staggered double row with 15ins (38cm) between rows and 18ins (45cm) between plants. 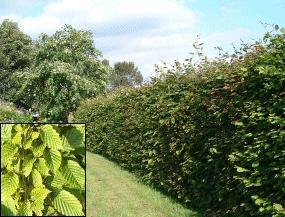 Hornbeam is also excellent for pleaching. Sd = Bare rooted seedling. CG10 = Bundle of 10 cell-grown plants, click here for more details. Please enter length of hedge you require below. The number of plants and price for these will then be shown on the right hand side. Cell grown plants only available in packs of 10, so the price shown is for the number of packs required to get at least the number of plants shown.